YOU CAN SIT WITH ME is an inclusive and kindness campaign. It is a simple wristband with a life changing message. YOU CAN SIT WITH ME is an inclusive and kindness campaign. It is a simple wristband with a life changing message. 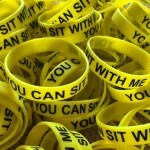 YOU CAN SIT WITH ME is a highly visible wrist band worn by children in schools, sports clubs and community groups to show that they welcome anyone to sit with them and that they are inclusive. Children are trained what to do and say if someone comes to sit with them by asking “Are you ok?” At no time does the child need to offer advice nor intervene in the problem rather offering a safe place to sit and referring them to a teacher if they feel they need help. It is simple, safe and changes lives. YOU CAN SIT WITH ME will also strengthen communities with children of all grades and ages able to sit with different grades and ages fostering friendships across schools, sporting clubs and communities. YOU CAN SIT WITH ME tells everybody in your schools, sports clubs and community groups, you welcome anyone to sit with you no matter what culture, religion, grade or age the person is.